I can't say that I've always been a big fan of the concept of Valentine's day. I don't need a specific day to remind me to tell the people I love that I love them! I make a point to tell my kids everyday just how much I love them, even when they've driven me nuts. I always remember to tell them that I love them to the moon and back and around all the stars before I tuck them in at night. I can admit, however, that after 10 years of being with my husband, I have gotten a bit slack at letting him know how much he means to me. Our wedding anniversary is four days after Valentine's day so we tend to just skip over February 14th, but not this year! This year I am going in with gusto. I've come up with 5 fun crafts/foods/surprises to make this Valentine's memorable. So, check back each day because I will be sharing one idea per day for the next five days. First up... Heart Shaped Quinoa Pancakes! Mix all of the ingredients together in a bowl. I like to use my large pyrex as it has a pouring spout for easily controlling the amount of batter that goes into the pan. Let the mixture rest for 15 minutes to let the quinoa flakes soak through and expand. Heat the skillet or frying pan to a moderate to high temperature and melt a dollop of butter to coat the surface of the pan so that the batter doesn't stick. Pour the batter onto the hot pan and cook on the first side until the batter begins to get little bubbles all over the surface, then flip the pancake and continue to cook until golden brown on both sides. 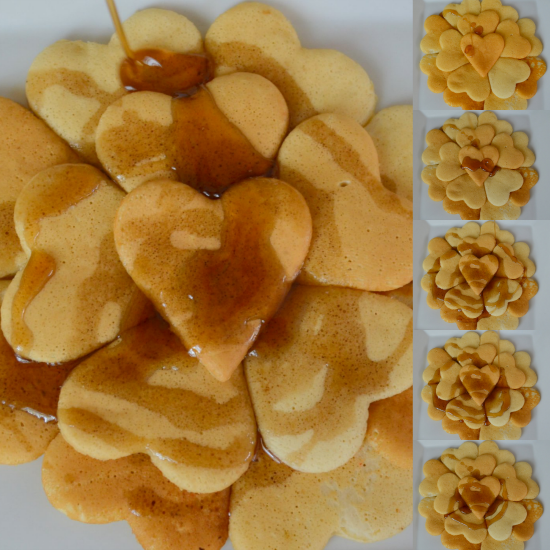 Transfer pancakes to a cutting board and using a heart shape cookie cutter, cut out heart pancakes. Arrange on a warm plate and douse in warm maple syrup!